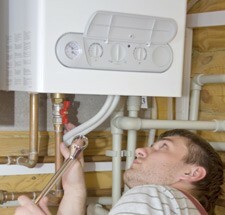 Boiler maintenance is very important as unsafe boilers can be a risk to your safety. Regular maintenance and an annual service is highly recommended and, as trained gas professionals, we will ensure your appliance is kept in working order and fix any potentially dangerous problems before they become safety issues. We are happy to provide a service at a time that is convenient to you. We can work out of business hours so that you don't need to take time off work. We recommend that you book a boiler service on an annual basis for the safest performance. A boiler service will involve running the system to check for any problems, a check for gas leaks and cleaning parts where required. Depending on the make and how often it is serviced, a full maintenance can take as little as half an hour. Contact us in Notthingham on 0115 815 7281 and we can give you a free estimate on costs.